Soak the rice in the water or pandan juice for 3 to 6 hours. Remove and drain. Place the rice in a steamer tray lined with muslin, and steam over medium heat for 30 minutes. Place the coconut milk, sugar and salt into a saucepan and bring to a boil. Remove from heat and strain through a muslin cloth. Mix the rice with the coconut milk mixture. Stir to mix well and set aside, covered, for 20 minutes. Just before serving, mix coconut milk and salt in a pan over medium heat. Bring to a boil, stirring. Remove from heat. 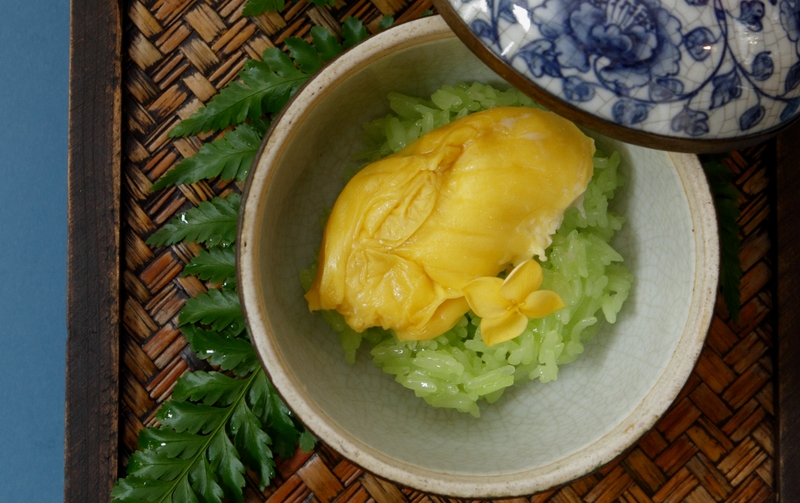 Place some steamed glutinous rice into a serving bowl, top with a little durian and pour the warm coconut sauce over. Serve immediately.